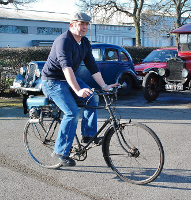 The roots of the Mini Motor can be traced to post-war Italy, where Vincenti Piatti, later to design the Piatti Scooter, produced the 'mini motore' in 1946, initially designed to power portable lathes, but quickly adapted to power conventional bicycles in a post-war era when petrol was still in short supply. British rights to produce the Mini Motor were acquired by Croydon based Trojan, known for their robust two-stroke engined cars and small commercials, and the Mk 1 Mini Motor appeared on the British market in 1949, and continued until 1957, by which time the Mk V model was current. 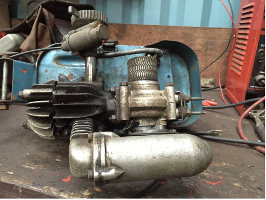 Versions were also made to power lawn-mowers and as an outboard motor for boats. 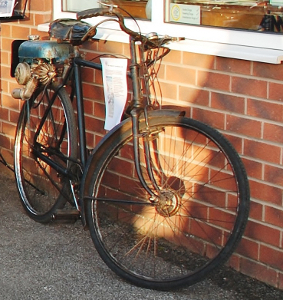 Our Mini Motor is attached to a standard 1950 Raleigh bicycle - the Raleigh company was established in Nottingham in 1885 and took its name from its first home in Raleigh Street. This, one of our smallest vehicles, has been in storage for some years, and was brought in to the light of day in 2015 and restored to running order. The 'business end' under repair. An action shot on our March 2016 Open Day.